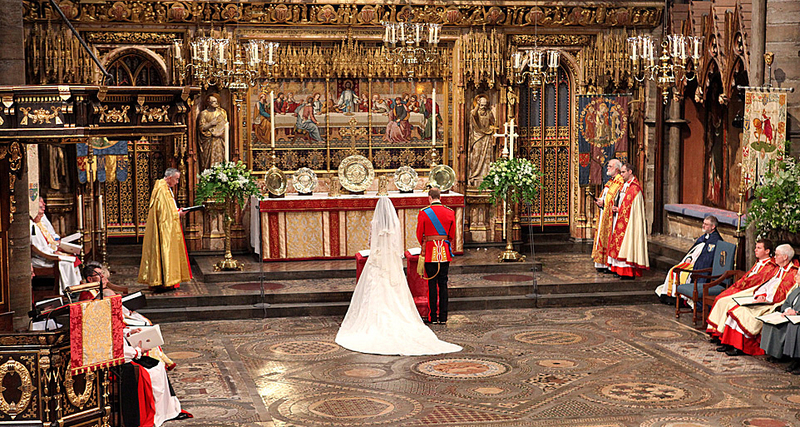 The significance of the sanctuary floor in relationship to the British monarchy was well illustrated by its prominence in the wedding of Prince William and Kate Middleton. Coronations and weddings would take place on this spot. 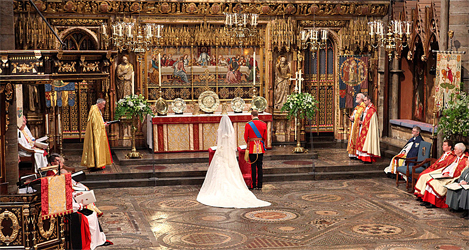 It would have been visible during the coronation of Anne Boleyn on June 1, 1533 in Westminster Abbey. 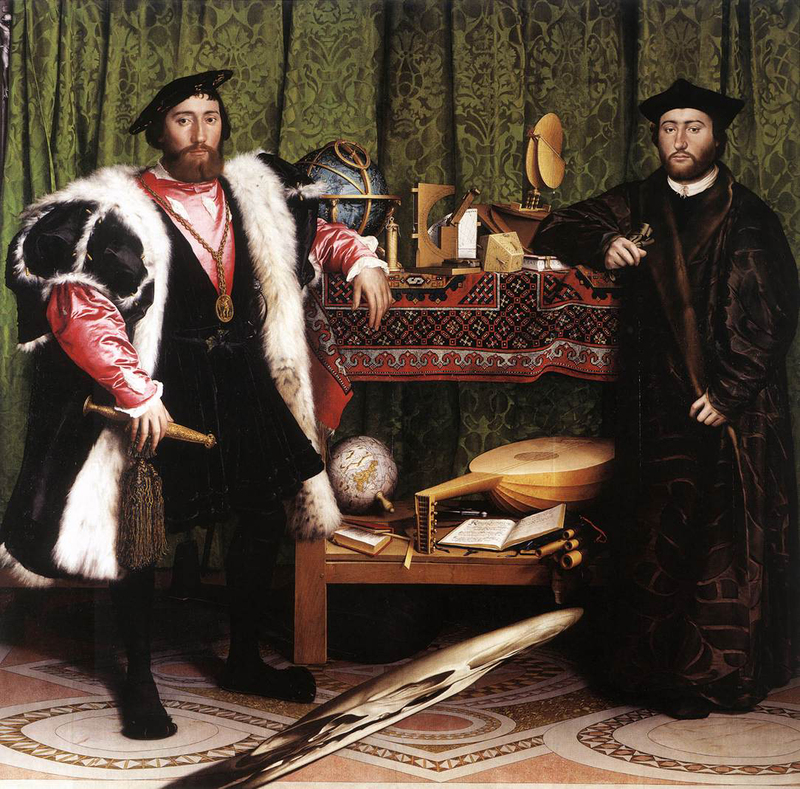 No satisfactory explanation has been presented for Holbein's inclusion of this detail in the painting. A crucial clue is presented by an inscription in bronze letters set into the sanctuary pavement. This inscription is now largely lost, but two fifteenth century transcriptions allow the reconstruction of the original text. *The verses written along the perimeter of the large outer square date the floor to 1268 during the reign of Henry III and identify the Roman mosaic worker Odoricus as the maker. *Another part of the inscription, apparently placed on a strip around the four circles next to the central circle, predicts the duration of the world or the end of the primum mobile. * Around the central circle appears the inscription: Spericus archetypum, globus hic monstrat macrocosmum. Steven Wander has noted the ambiguity of this verse. * It is not clear whether "spericus" and "globus" refers to the central circle. As Wander observes, archetype and macrocosm were distinct concepts in medieval cosmography: "The archetype refers to the idea of the world in God's mind before its realization in matter. The macrocosm denotes this idea of the world after its formation in matter; it's the sensible world formed of the four elements. "* Depending on one's understanding of the central inscription, either the central circle represents the archetypal macrocosm, or the pavement contrasts the archetype to the macrocosm. Despite this uncertainty about the translation of this central inscription, it clearly establishes the cosmological significance of the pavement as a diagram of the universe. 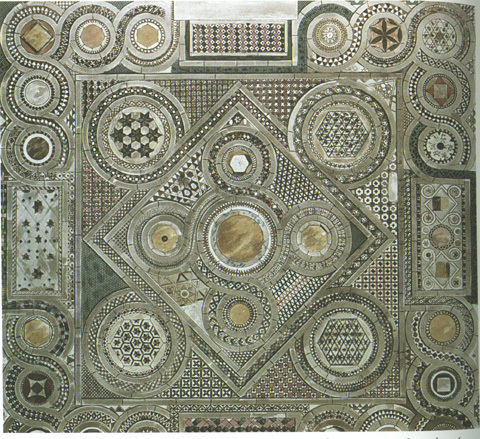 Even without the evidence of the inscription, the design of the floor can be seen as a diagram of the macrocosm. The pattern of circles and squares relates to a tradition of macrocosm diagrams which extends back at least to the encyclopedias of the early Middle Ages, and which visualizes cosmological ideas of world-harmony extending back to Pythagorean and Platonic thought of Antiquity. * Greek philosophers elaborated on the essential tetradic structure of the macrocosm and microcosm, correlating the four elements of the world to the four temperaments of man, the four seasons of the year to the four ages of man. Variations of this pattern can be found in other major monuments of Renaissance art. As noted above, it appears on the floor of the Sistine Chapel directly beneath the Creation of Adam. Understanding the floor as the macrcosm adds a resonance with the juxtaposition of the floor as macrocosm to the creation of Adam as the microcosm. This symbolism reinforces the central meaning of the Creation of Adam in the ceiling and the chapel as a whole. Appropriately this symbolism articulates the central position of "Man" in Renaissance cosmology. It is significant to see how Raphael has placed the Papal Arms as the center of his ceiling, while the center of the floor in Holbein's painting is covered by the anamorphic skull, the symbol of human mortality. 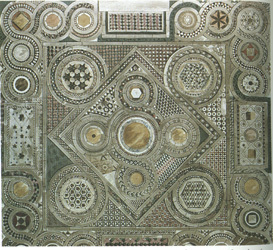 Understanding the floor as a symbol of the macrocosm has significance for our understanding of the painting as a whole.